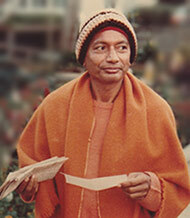 Swami Venkatesananda's reverence for The Bhagavad Gita was constant throughout his lifetime. As Swami Sivananda's literary secretary and the Sanskrit scholar in residence at Vedanta Forest Academy in Rishikesh, he took on the responsibility of editing Sivananda's own Bhagavad Gita, published by The Divine Life Society in India and in South Africa. Many years later, in an effort to illuminate the day to day practicality of The Bhagavad Gita, he produced another popular edition, Song of God Daily Readings. Swami Venkatesananda saw The Bhagavad Gita as the greatest treasure of practical wisdom, and an essential companion for any serious student of yoga. His enthusiasm for The Bhagavad Gita can be found in the many hundreds of lectures (many of which had been published by others) he gave in different parts of the world. In Australia, it was requested that he deliver a series of lectures on the Sixth Chapter of The Bhagavad Gita. In May of 1980, he delivered five talks. Unfortunately, the fifth and final talk in this series has not been recovered. However, we do have the first four of these inspiring lectures, and feel compelled to upload them here, unedited, as MP3 files. Additionally these four talks have also been transcribed verbatim, so that first time listeners, those who initially have difficulty understanding an Indian accent can follow along while listening to the audio, so as not to miss a word of these inspiring talks.